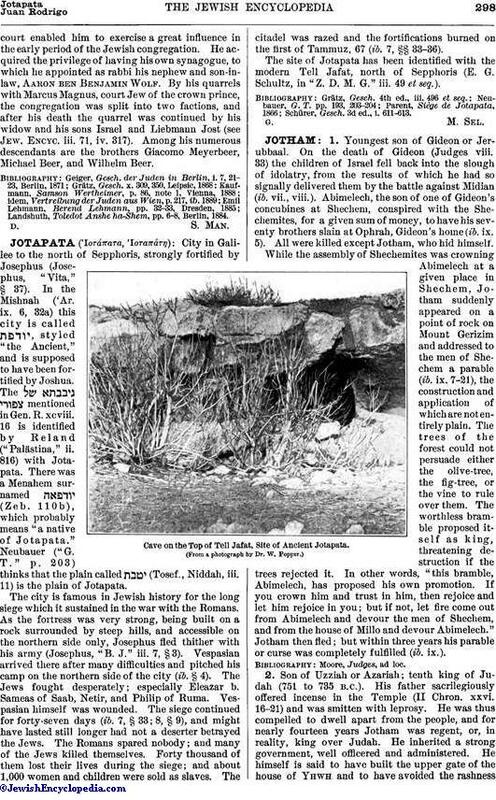 City in Galilee to the north of Sepphoris, strongly fortified by Josephus (Josephus, "Vita," § 37). In the Mishnah ('Ar. ix. 6, 32a) this city is called , styled "the Ancient," and is supposed to have been fortified by Joshua. The mentioned in Gen. R. xcviii. 16 is identified by Reland ("Palästina," ii. 816) with Jotapata. There was a Menahem surnamed (Zeb. 110b), which probably means "a native of Jotapata." Neubauer ("G. T." p. 203) thinks that the plain called (Tosef., Niddah, iii. 11) is the plain of Jotapata. The city is famous in Jewish history for the long siege which it sustained in the war with the Romans. As the fortress was very strong, being built on a rock surrounded by steep hills, and accessible on the northern side only, Josephus fled thither with his army (Josephus, "B. J." iii. 7, § 3). Vespasian arrived there after many difficulties and pitched his camp on the northern side of the city (ib. § 4). The Jews fought desperately; especially Eleazar b. Sameas of Saab, Netir, and Philip of Ruma. Vespasian himself was wounded. The siege continued for forty-seven days (ib. 7, § 33; 8, § 9), and might have lasted still longer had not a deserter betrayed the Jews. The Romans spared nobody; and many of the Jews killed themselves. Forty thousand of them lost their lives during the siege; and about 1,000 women and children were sold as slaves. 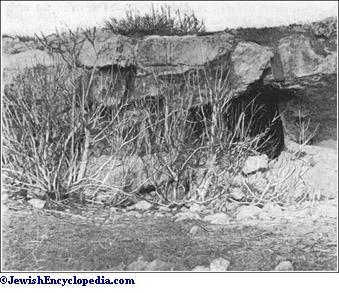 The citadel was razed and the fortifications burned on the first of Tammuz, 67 (ib. 7, §§ 33-36). The site of Jotapata has been identified with the modern Tell Jafat, north of Sepphoris (E. G. Schultz, in "Z. D. M. G." iii. 49 et seq.). Schürer, Gesch. 3d ed., i. 611-613.